The rise of the smartphone has unleashed a wave of excitement and income generation across the software development community. Applications that can run on iPhones, Android phones and Blackberry’s, can be written quickly, and on the cheap, and have generated outsized returns for their creators. Even more impressive is that this application revolution is just starting. 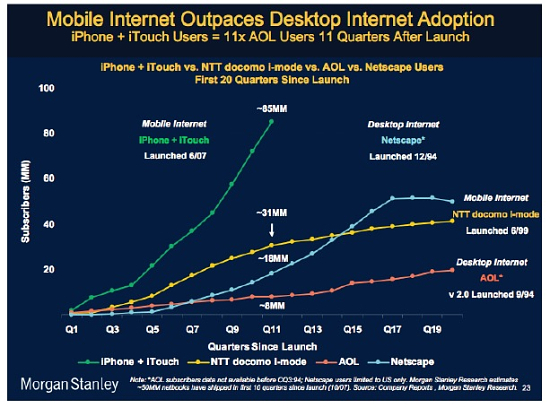 As Darrell Owen pointed out in the Apps4D presentation at a Business Growth Initiative meeting, iPhone adoption is growing at an order of magnitude faster than any other Internet technology – 11x the rate of AOL at its peak. In addition, smartphone adoption in the developing world is only at 3-5%, compared with 70-80% for mobile phones in general. Smartphones are the emerging middle class aspiration, and will be the mark of financial arrival that can be conspicuously displayed for all to see. Does smartphone application development offer a real opportunity for advancing entrepreneurship in the developing world? How could donors facilitate the efforts of private industry to accelerate application development? What impact would investments in application development have on international development goals? To these three questions, I propose these answers on how software application development can be an engine for entrepreneurship and economic growth in the developing world, on a limited basis. Right now, Facebook is driving ICT adoption in Africa. But Facebook is not coded in Africa – its written in Silicon Valley, where the majority of commercial and website software comes from. Yet there are a number of successful software companies in Africa. In fact, MXit, a mobile social network holds its own in South Africa and just expanded into Kenya with Safaricom. In addition, software development centers like Accra, Lagos, Nairobi, and Kampala are churning out applications for smartphones and even basic mobile phones, which can only SMS. Applications like OhmSMS and iWarrior show you what’s possible – and that’s without any donor support. Now imagine if these same mobile application software developers had access to mentoring from established leaders in the field, if they were able to share experiences and resources with their peers in a results-focused environment, and if seed funding and growth financing were easy to obtain. That’s exactly what Limbe Labs and Appfrica Labs are attempting to bootstrap with their incubators. And its what infoDev at World Bank aims to achieve with its Regional Mobile Applications Laboratory grants – seeding world-class entrepreneurship in at least two locations in Africa. The private sector will be quick to capitalize on Africa’s software development for their own mobile applications – and let them. The donor community should leverage this opportunity to ensure there are social development applications as well. Just look at what the Kenya ICT Board is doing. They’re investing $4 million in grants from the World bank’s International Development Association for mobile applications to enhance citizen participation in eGovernment. I could see an Apps4D program using the same approach to bring eGovernment services to businesses, or eLearning to expand the reach of secondary or adult education. Before we get too excited about Apps4D, a little history. Back when every country thought they could become a Business Process Outsourcing (BPO) hub, like India, by proclaiming themselves a Silicon Valley and investing in software development industries, USAID spent many millions on improving software development business skills and enabling environments. The expectation was that BPO would magically employ thousands and the IT industry would be the path to middle class incomes for all. That didn’t happen, and BGI found little long-term employment impact from all those millions. But that should not be a surprise – IT isn’t a high-employment industry. It only takes a handful of coders to produce the most elaborate software. One person can write good mobile software applications, which is both a strength and a weakness. Youth are the largest cohort of unemployed in Africa, with young males the most listless. Yet they’re also the most tech-savvy and mobile phone addicted. By showcasing one or two young mobile application software development stars, coders who make it relatively big through their apps, we could engage an entire generation to focus on positive role models. Just look at the following Google has across Africa at their developer-focused Google Technology User Groups – software development hopefuls flock to their meetings. Still, there isn’t a need for that many software developers. So don’t expect an Apps4D program have a big employment impact. It will only create a handful of good jobs. Instead, measure it by how many youth look to mobile application development as an inspiration for the basics of good grades and dedication to employment. While mobile software application development can be an engine for entrepreneurship and economic growth in the developing world, it should only have a small role within a larger context. It’s the sizzle that can help sell the development basics of improvements in education, employment, and business climate. At a few hundred thousand dollars, the infoDev regional mobile application labs are a rounding error in USAID mission budgets, yet imagine the positive publicity and impact when one of them creates the next ChildCount+ or Ushahidi! If you’re interested in a further discussion of Apps4Dev, then join me as I moderate a panel discussion on this topic at the World Bank: Apps4Dev: a panel discussion at infoDev Annual Symposium. Thanks for the great post and overview! I am sorry I will miss the infoDev event – it sounds very interesting. I take your point on employment, though I think the dynamics of the BPO market and mobile apps markets will be rather different. BPO required fairly significant technical and language capabilities, which made it difficult for it to generate significant employment. Moreover, in the BPO projects I’ve seen there was a big issue of creating enough of a BPO eco-system to be of interest to a larger firm. A lot of BPO efforts I saw were too small to be of interest to major international firms or simply too risky. Those same efforts also lack linkages to mid-tier and smaller firms that might be interested in a smaller scale BPO capability. Mobile apps require a much lower technical ability on the part of the developer and there is no linguistic requirement other than ability in one’s native language. In addition, mobile apps are a highly localized product – the goal here is not to export apps, but rather to tap into a local market. Thus, the barriers are much lower and entrepreneurs are not competing in an international market, but domestically. That being said, I think we simply don’t know how much of an employment driver mobile apps might be. We need some pilots to experiment and see if this really can work.